WatchGuard FireboxV adds best-in-class network security to your virtual environments. Running on industry-standard servers including Microsoft Hyper-V and VMware vSphere, FireboxV gives you real-time monitoring, multi-WAN support and scalable solutions to fit your business. You can manage all your virtual and hardware firewalls from a centralised management platform using WatchGuard System Manager, the command line interface or the WebUI. 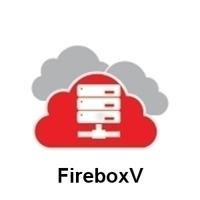 FireboxV comes in four sizes and is available with standard support, optional security subscriptions such as WebBlocker or GateWay AntiVirus as well as the Basic and Total Security Suite. WatchGuard FireboxV Large with 3-yr Total Security Suite including WebBlocker, Application Control, spamBlocker, Gateway AntiVirus, Network Discovery, IPS, Reputation Enabled Defence, Data Loss Prevention (DLP), Dimension Command, APT Blocker, DNSWatch, Threat Detection and Response, and Gold Support.